What’s Next After UK Unemployment Falls to 43-Year Low? Unemployment rates in the UK remain in a steep decline as they dropped from 4.2 percent to 4.0 percent during the second quarter of 2018. Despite the improved employment figures, the pay growth in Britain remains sluggish and weak. The Office for National Statistics (ONS) shows both wage growth and unemployment rates moving lower. The Bank of England forecasted overall pay increases, due to the tighter labour market. It's time for a closer look at why the better employment rates are not creating the expected increase in wages. What is causing this divergence? The decline in the UK unemployment rate from 4.2 percent to 4.0 percent confirms the continuation of an already established downtrend. The unemployment figure has been falling steadily since 2012, which is when the rate peaked at around 8.4 percent due to the global recession of 2008-09. The jobless rate has not been that low since the year 1975. Another piece of good news is that the current six year streak has not yet ended, as the new numbers indicate. 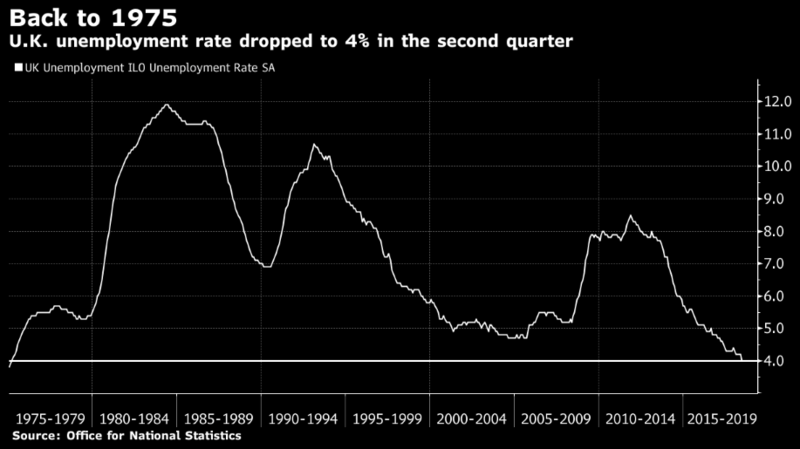 The downtrend clearly broke below the already quite low unemployment levels between 2000 and 2007, which saw averages around 4.5 percent to 5.5 percent. According to the Guardian, 1.36 million people remain unemployed, representing a decline of 65,000, whereas just under 32.4 million are employed, with an increase of 42,000 in the previous quarter. It also saw the largest decline in the past two decades in terms of workers from the EU. So what's next? The BOE officials still expect a further decline of the unemployment rate, which is forecasted at 3.9 percent later this year. Also, the secretary of state for work and pensions, Esther McVey, mentioned that: "with the unemployment rate falling further to just 4%, and youth unemployment down over 45% since 2010, school leavers this week can look forward to a growing job market, improving the prospects for their future careers." So far there appears to be good news. There was a 42k gain in employment, however, it was only half of the forecasted increase, and there were more signs of weakness in the labour market report. The jobless rate seems to have dipped primarily due to employees exiting the workforce, as the employment rate dipped to 75.6 percent. The weaker wage growth was another disappointment. Despite the employment rate improvement, wages have not been able to keep up as was expected by the Bank of England. In fact, pay growth reached its weakest point in almost a year. This was surprising as a tighter labour market usually leads to an increase in wages, as the competition for employees intensifies. The annual growth rate of total pay declined from 2.5% to 2.4%. Regular pay slipped down to 2.7% from 2.8%, which is the weakest since January, but still more than the 2.4 percent rate of inflation. 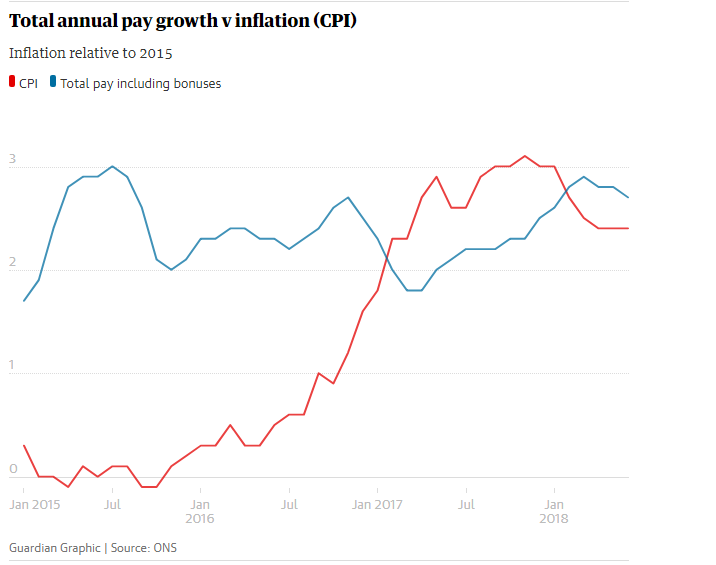 Average weekly earnings adjusted for inflation (real pay) increased by 0.1% (including bonuses) and by 0.4% (excluding bonuses). Who were the winners and losers? The growth change was unequal for various sectors. The fastest pay growth was visible in the following three industries: financial services, construction & insurance, and hospitality & catering. However, real pay declined in other sectors such as agriculture, health & social work, utilities, and the arts. What does this mean in the larger picture? "Achieving sustained increases in wage growth remains a key challenge, with sluggish productivity, underemployment, and the myriad of high upfront business costs weighing down on pay settlements," said Suren Thiru, who is the head of economics at the British Chambers of Commerce. He explained in more detail that "as such, there remains precious little signs that wage growth is set to take-off – undermining a key assumption behind the monetary policy committee's recent decision to raise rates." In other words, did the Bank of England increase interest rates perhaps a bit too early? In any case the wage growth seems to be making an increase, at least in the near future, less likely. Interest Rate Decision by BoE in Trouble? 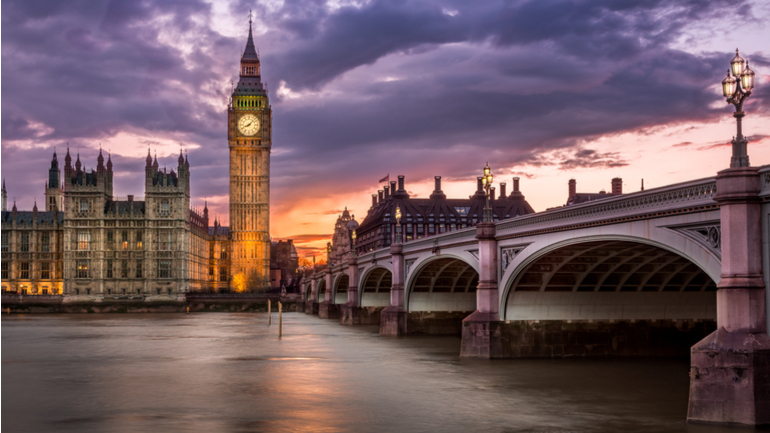 The Bank of England (BoE) increased interest rates, at least partly, due to the downward pressure of the unemployment rate. Lower unemployment levels typically fuel and encourage inflationary pressures due to wage growth, which takes place because employers compete to retain and attract employees. The decision was made unanimously, but the pay growth, which settled in at 2.4 percent, does not confirm the vision of the board as yet. The rate in fact decreased, rather than, proceeding to move closer to the expected 3.5 percent. Suren Thiru, head of economics at the British Chambers of Commerce, added that "the pace at which pay is exceeding price growth remains negligible, and is therefore unlikely to provide much respite to the financially squeezed consumer." The pay trend does not seem to confirm the expectations of the Bank of England. Chris Williamson, chief economist at data firm Markit, said that this trend "will add to suspicions that interest rates will not rise again in the immediate future, and most likely will not until a smooth route through the Brexit process becomes apparent". He also added that there are "signs of the economy losing some momentum again at the start of the third quarter.". The current interest rate in the UK is 0.75 percent, which seems to be in the middle of the other major currencies. The US Dollar is hovering around a 2 percent rate, the New Zealand Dollar offers 1.75%, both the Australian and Canadian Dollar come in at 1.50%, the Euro remains at 0%, and the Japanese Yen and Swiss Franc remain in negative territory with -0.10 and -0.75 percent respectively. To keep track of important announcements that will have an impact on currency pairings such as changes in interest rates, unemployment rates, and inflation, be sure to check out our Forex calendar, which breaks down all the upcoming events worldwide, and provides useful information concerning previously forecasted statistics, previous figures, and much more! Other trends were also visible in the job market report. There was a decline of EU workers working in the UK, together with, the number of people on a zero-hours contract as part of their main job. The zero-hours contracts dropped by 104,000, to a new low at 780,000. A zero-hour contract indicates that there is no guarantee of a minimum number of hours worked per week. Additionally, the social work and health sectors saw a huge drop of 62,000. Senior ONS statistician Matt Hughes said: "For the first time since we started tracking zero-hours contracts, we've seen a substantial fall in the number of people on one in their main job." There was also a significant change in the employment of EU nationals from countries who joined the European Union back in 2004: the decline reached a total of 86,000 jobs. This is the largest decline in workers from the EU in the past two decades when measured on an annual basis. The GBP/USD has already been in a significant down trend since April 2018. The Cable peaked near to 1.44 before embarking on a 1,700+ pip drop. As of Wednesday 15 August 2018, the GBP/USD showed a new low near 1.2670. The downtrend started with a large drop, which took the price down to 1.300 by June 2018, after which a trading range developed between 1.30 and 1.33. The recent bearish break is showing strong bearish momentum, and is confirming the continuation of the downtrend. With the current trend, momentum and wave patterns, the GBP/USD could be ready to challenge the 1.20 round level, and perhaps even break below the low bottom of October 2016. The bearish momentum is strong because the price has not only broken below the bottom of the Keltner Channel but has also stayed below it. 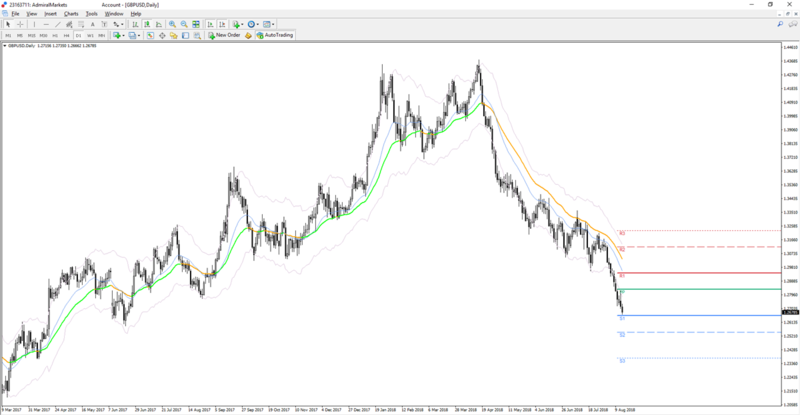 The angle of the 34 ema close is also showing a steep angled moving average. Both indicators are confirming the fact that the bears have significant control over current price action. Any bullish retracements are expected to be shallow. Likely price patterns will be bear flags, contracting triangle patterns, and sideways ranges. All of these price patterns could confirm more bearishness as soon as the price breaks below the support. A breakout below classical trend lines, moving averages, Keltner channels, etc could confirm the continuation of the trend and the potential for a new low. The price will probably not be able to break above larger resistance levels as well. Round levels such as 1.2750 and 1.30 are likely to hold, just as weekly Pivot Points and Fibonacci levels will probably stop the GBP/USD from making any significant gains to the upside. The bearish trend is only invalidated if the price were to show very strong impulsive bullish price action, a series of higher highs and higher lows on the 4 hour and daily chart, and/or a bullish break above the 1.30-1.31 resistance zone. Otherwise, a downtrend is likely to fall towards 1.25, 1.2350, 1.2250, 1.21, and 1.20. The best course of action is probably to keep an eye on the candlesticks on the 4 hour, daily, and weekly charts, and also monitor the price charts and technicals for possible retracements, continuation breaks, and continuation bounces.